Not all LED Heatsinks are made equal! Cooliance provides a range of pin fin forged high-performance passive, and Coolstrate® active, pin fin LED heatsinks for CREE LEDs. These heatsinks offer industry-leading thermal performance. This range of CREE COB LEDs mount onto the heatsink using an LED Holder. Please refer to the LED holder page, detailed in the sidebar, for product information. 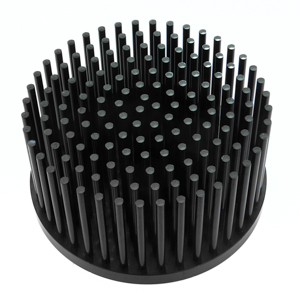 Heavy-duty, high-density pin fin heat sinks are designed to eliminate internal dust build-up – our field tests prove it. Diameters of 20 mm to 160 mm are offered within the standard product family. Consult factory for other sizes. 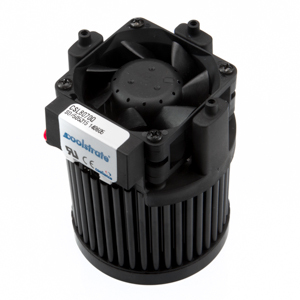 Standard or modified standard solutions - We can provide a solution from our standard product line and model it to ensure that it will provide adequate cooling for your application.. Forging can produce round and other non-linear shapes that are preferred for LED applications. The forge process uses high pressure to form the material and provides control over the grain structure to provide superior thermal performance. LED’s are generally convection cooled and our forged pin fin arrays provide the best possible thermal performance in ambient environments. Heat sinks can be forged in either aluminum or copper. Custom design services - Our thermal engineers can also work with you to design and model a custom solution optimized to meet the needs of your application. Contact Cooliance to find out how we can assist you with your next luminaire project. Disclaimer: While Cooliance makes every effort to provide accurate information on this website and supporting documentation, we recognize that each manufacturer that we cross-reference may update their product range by discontinuing or adding products in between our website updates. The Cooliance engineering team will validate all product information for you when you submit an inquiry.